You do not have to travel far in order to acquire the motorcycle. You may have to do less paperwork in order to transfer the title of the motorcycle to your name. You can ride it back home with no apparent problems. Yet, there are moments when you will find that the only bike that you love can be found in another state and you just have to have it no matter what the efforts you have to do in order to see it in your garage. 1. Double check the motorcycle that you want to purchase. There is a good reason why you opt to purchase this certain model and type of motorcycle out of all the others that you have seen before. You do not care that much if you have to pay more because you love the bike and you know, once you fall in love, it will be hard to love another bike found within your state. Double check the listing of the motorcycle and make sure if it is authentic. You can double check if the seller has sold other items before by checking the reviews. If you see mostly or all positive reviews, you know that you are dealing with a real seller. If the seller has no reviews yet, you may want to wait a while because some scammers pretend to sell things online but once the money has been provided, they leave. 2. Send the payment to the seller ahead of time. By this time, you may have contacted the seller and you have informed the seller of your intention to buy the motorcycle. You may haggle a bit unless the seller states in the listing that the price is fixed. When you haggle, you may be able to get the motorcycle in a slightly lower price as compared to the listing. Send your payment ahead of time. You may not agree with this but if you plan on taking home your motorcycle the easiest way, this is the best option. This will allow the seller to prepare everything in advance before you fly to the state one way in order to get your motorcycle. 3. Ride your motorcycle home. Since you have sent your payment ahead of time, the seller would give you a temporary pass that is valid for 30 days. This means that you do not have to worry about having to fly the motorcycle on the plane or to hire a shipping service that will charge you a lot of money. If you would be stopped because you do not have any license plates, just show the temporary pass but most likely, you will not be stopped for riding a motorcycle from another state because it would only seem like you are passing by. The length of time that you have to spend on riding your motorcycle home will depend on how far the state is. At least you are given a 30 day pass so if it is truly far, you know that you will get home on time before the pass expires. If in case the seller does not give you a 30 day pass, you may get the temporary registration pass on your own. 4. Start with having the title of the motorcycle transferred in your name. You do know that titling can be almost the same for new and used motorcycles. You have to submit all the documents needed like your application form, proof of ownership, proof of purchase price and taxes. There is also a need for your motorcycle to be inspected to check if it will not be a problem when being used on the road. Depending on the state that you are in, you may be required to submit additional documents too. The fees are not that high but will depend on your state. Remember that you do not have to pay taxes on the state from where you have purchased your motorcycle. Some people make this mistake and end up paying for their motorcycle’s taxes twice. You only need to pay the taxes from your state once you bring the motorcycle home with you. Do not forget about your insurance. Get insurance for your motorcycle and it is likely that after 30 days, you will already be covered. 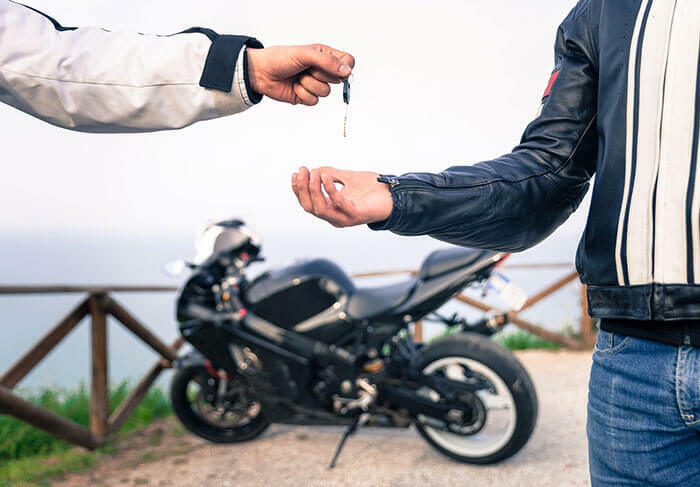 It can be a stressful experience if you do not know what to do but hopefully after reading the steps that are mentioned above, you are more confident about bringing your bike back from another state.